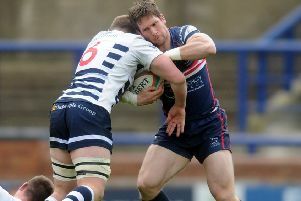 In the opening game of the new RFU Championship Cup, Yorkshire Carnegie eased by Nottingham by six tries to three. Carnegie got off to the best possible start with a try in the opening five minutes through Kieran Frost. After Peter Lucock’s line break, Carnegie worked the ball out to the right wing where Frost crossed the try line unchallenged. Nottingham didn’t have to wait too long to tie the game when Will Millett’s try came after a number of phases in front of the Carnegie’s posts. The defence was drawn in and Millett found a gap between two defenders to score his first try of the match. Jacob Umaga scored on his debut for Yorkshire Carnegie after a beautiful passing display. As the ball was going out to the left-hand side, a lovely inside pass from Joe Buckle slicedopen the Nottingham defence and Umaga gratefully received the ball to cross over the try line. Carnegie seemed rejuvenated by their new signings as Umaga and Te Rure were pulling the strings. Two tries in as many minutes just before half-time from Antonio Kiri Kiri and Dan Temm gave Carnegie a solid 24-7 lead at the break. Carnegie once again started the half quickly and they blitzed the visitors with two more tries early on through debutant Tom Hill and Kiri Kiri once more. Both tries were converted by Te Rure and Carnegie were firmly in control 38-7. Millett scored his second try of the match when he broke through the Carnegie defence and showed a great turn of speed to race away from the chasing defenders. Then a consolation try in the final minute of the game for Nottingham debutant Harry Graham ended proceedings at 38-19. It was a dominating display from start to finish for the home side and Yorkshire director of rugby Chris Stirling feels his team sent a message to the rest of the clubs in the competition. He said: “I think we put a little bit of a statement out there but we’ve got a long way to go. We’re still missing some key players but we’re stepping in the right direction at least,” he said.